On the last weekend in January, I ran my first stage rally and I survived. Not just survived, but we finished fourth in class out of nine on Saturday. Like many people, my first exposure to going fast in the dirt was through SCCA Rallycross. I bought my FR-S in 2013. It’s still my DD, and I love it. As soon as the break-in period was finished, I signed up for the next local autocross. I was terrible, but I improved each run. I autocrossed for a few months, getting slightly better with each event. After a few events, my driving started getting more agressive. The bodywork ended up with a lot of cone scratches on the front, as well as a few on the sides and back (oops.) The local SCCA chapter, TVR, had a yearly event called the Iron Man. This event consisted of drag racing Friday, autocross Saturday, then rallycross Sunday. Bonus points were awarded for using the same car for all three events. Unfortunately, the drag strip wasn’t open that weekend, so the contest was just autocross then rallycross. I decided to try it. I was instantly addicted, even though I needed to get a few pushes to get moving. For the next two years, I attended way more rallycrosses than autocrosses. My first step into rally came a year and a half. I bought a five day pass to Team O’Neil rally school during black Friday, though I didn’t end up going until April. Between then, I moved to the Detroit metro area. I’ve been really enjoying living here. The car culture is unparalelled. I quickly found a group of friends that wanted to help me build a LeMons project, a 1962 Plymouth Fury from NSF Racing. It didn’t have an engine at the time, so I was on the lookout for interesting donors (as in, no Chevy V8s.) I then saw this lovely post on Jalopnik. This car was a short drive away in Ann Arbor, and I thought a BMW straight 6 would be a hilarious engine for an old Mopar. I went to meet the seller, and the car was quite a piece. Along with the blown struts, the car had a junkyard engine. The seller said he had unknowingly bought it with a cracked head, and had to swap the motor. I gave him the asking price and he gave me every single thing he had related to the car, since he just wanted it gone. My teammates eventually convinced me (correctly) that this was a terrible engine swap candidate. Oh well, on to rally school. Team O’Neil was an incredible experience. I learned a ton, and decided to make the e36 into a rally car. The first thing I did was to fix the current issues, including replacing many sensors. While I did that, I also gutted the car and added Bilstein HD struts. Once the car was gutted and out of limp mode, I decided to take it to an autocross. I ran on some Hoosiers I got from the last owner, and the engine decided to attack the radiator using the fan. Oops. Eventually, I replaced the broken parts as well as a few things for reliability. I ran a rallycross with no overheating issues, so I was content that the car was solid. The next big step was getting the cage done. I had been considering doing it myself, but that would have involved teaching myself to weld and a lot of time and risk. 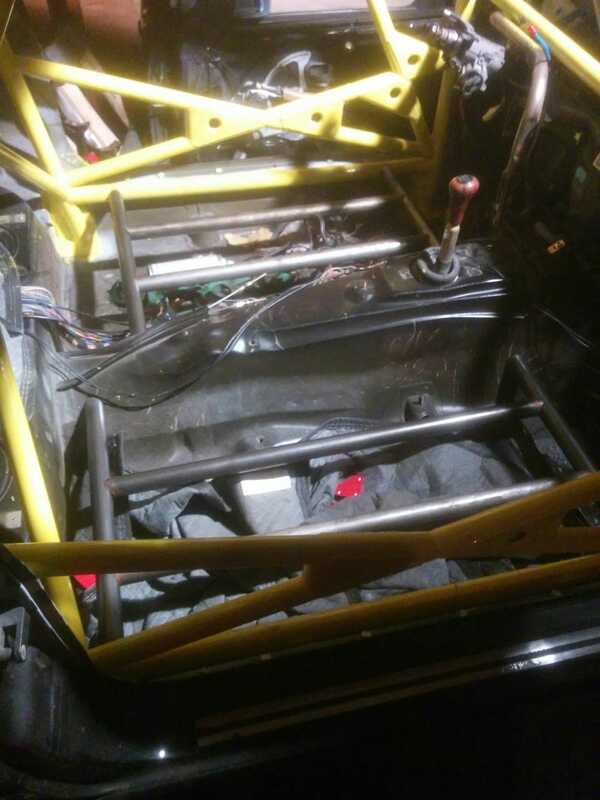 I spent the money to have Thompson Racing Fabrication make the cage, and it was well spent. They did a fantastic job. Now that the car had a cage, it was time to get serious about the rally build. The struggles of getting a new car prepared made it very obvious why all the old timers recommend buying your first rally car. With help from Logan Motorsports, we made some very overbuilt seat mounts. I had a huge struggle replacing the parking brake that hadn’t been working since I bought the car. In the process of getting the old cable out, I damaged a wheel bearing. While replacing that bearing, I stripped all six bolts holding the half-shaft to the diff. Somehow, I was able to get (almost) everything fixed and ready for Sno*Drift, including some last minute Braids thanks to Team Illuminata Motorsports. Through great luck, I met fellow racing enthusiast Jonathan Patrick Griffin who works at BMW of Rochester Hills. He became my crew chief and was able to convince them to sponsor the car. We towed the car out there Thursday night and went to tech on Friday morning. Luckily, they only had two small things that we needed to fix, and they said they could be checked off during Parc Expose. I was in, and before I knew it I was on the way to my first rally stage. My first stage was perfect, but not because of my speed. After waiting what felt like forever at park expose, since I was starting last, I was very anxious. About a mile into the stage, my door started opening around a tight right since I hadn’t closed it hard enough. I was able to laugh at myself and relax. I caught the red VW in front of me right before we entered a spectator area. Once the road was wide enough, he let me pass. I then caught a CRX on the next stage, East Branch +. Then I got stuck on stage 3. This was the first true night stage. When I got to the start line, the workers told me to watch out for more than one multi-car pileup. A few corners from the end of the stage, a faster car that had been stuck caught up with me. Because of my nervousness and the pressure of their lights in my rear view mirror, I missed a note from my co-driver about an icy tightening left. I got stuck in my first and only snow bank. The car was beached on the skid plate. Luckily, fast sweep was able to pull us out with a single pull, meaning we could continue the rally. We got a max time for that stage. Photo Credit: Jonathan Patrick Griffin. Friday service. After service, we ran the same set of stages again. Just darker and with more ice. On stage 6, I had a repeat of stage 3. The same car that was faster than us but kept getting stuck was behind us near the end of the stage. This time, I let them pass as soon as I could. Thanks to the rally karma, I didn’t get stuck again and finished Friday in seventh out of nine. Photo Credit: Jonathan Patrick Griffin. End of Friday. Having survived Friday with minimal damage, I was a little more agressive on Saturday. This was very difficult, as the car currently has the stock 2.93 open diff. I rarely exceeded 4000 rpm, and on some stages I was getting wheel spin in fourth gear. Photo Credit: Jason Swoboda Motorsports Photos. This is my favorite picture. Saturday was very challenging and very rewarding. 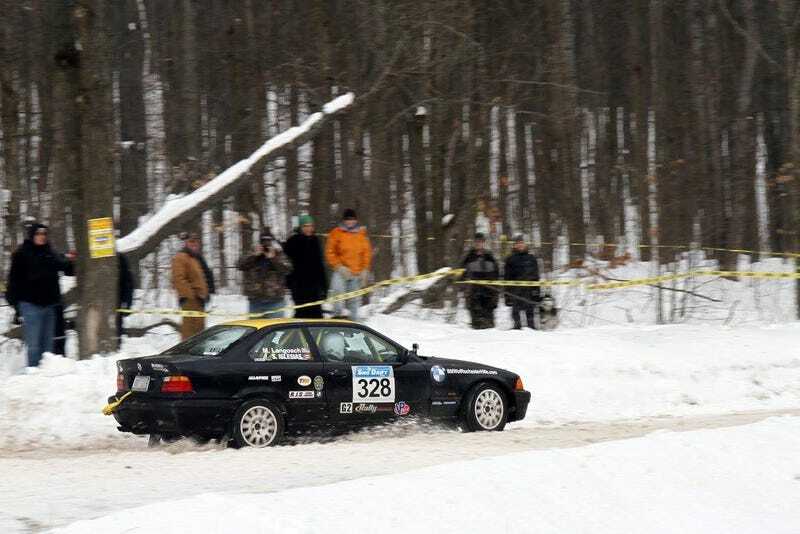 Thanks to my co-driver’s great notes, I slowed down for all the very icy corners and avoided getting stuck all day. By the time I came through the last stage, Bonfire Alley, I was simultaneously the most excited and nervous I could remember being. I cheered like a madman as I crossed the last finish line, but my co-driver quickly reminded me that it wasn’t over yet. We still had to get to the finish. After seeing a pack of deer less than a mile into our last transit, I started freaking out. The exhaustion and lack of adrenaline had me seeing things that weren’t there. I was scanning my field of vision like a mad man, catching glimpses of moving shadows that probably weren’t there. After what felt like the longest transit of the entire weekend, we finally made it to the finish line. Photo Credit: Jonathan Patrick Griffin. WIth my camera. We had accomplished more than I could have hoped for. Since regional entries are scored individually for each day, we weren’t held back by my fail on stage 3. We came in 3.9 seconds behind 3rd place, a Team O’Neil rental the #908 Fiesta, and just 8.8 seconds in front of the #122 Jetta. I couldn’t have asked for a better first rally, and I can’t wait for my next one!